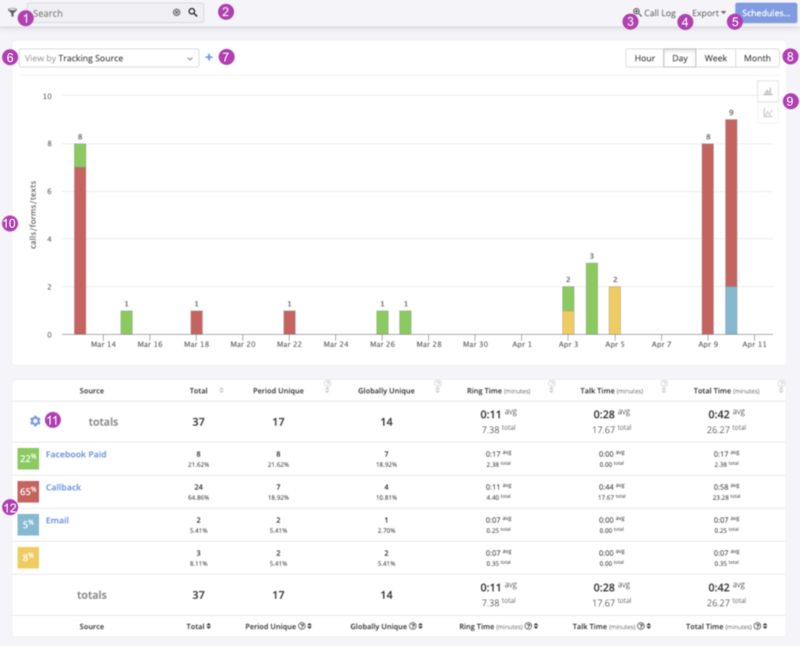 The Acvitity Reports page provides an overview of your calls over a set time period sorted by a dimension of your choice. 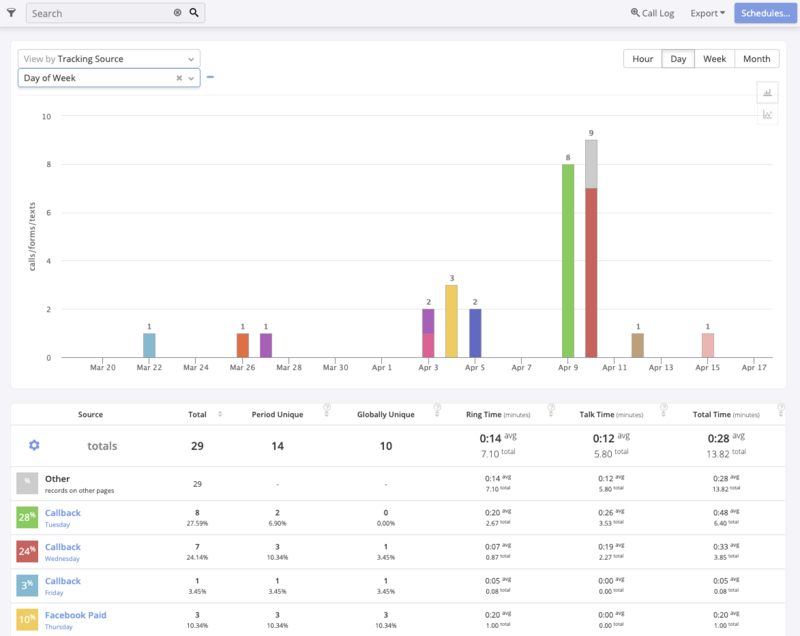 You can apply filters and date ranges to narrow down which calls you want to include in the report, and select a view (such as calls by source, calls by hour of day, or calls by campaign) to organize call data in the way that’s most useful to you. Your activity report can be exported or scheduled for repeat exports. Click here for more information on exporting data from this page. The Activity Reports page is found under the Reporting menu in your account. Filter: Click this button to open the filter panel and apply filters to your report. Search: Use the search field to quickly locate specific information within this report. View Filtered Call Log: Clicking this button will apply the filters you’re currently viewing to your call log, letting you view the specific activities that are included in your report. 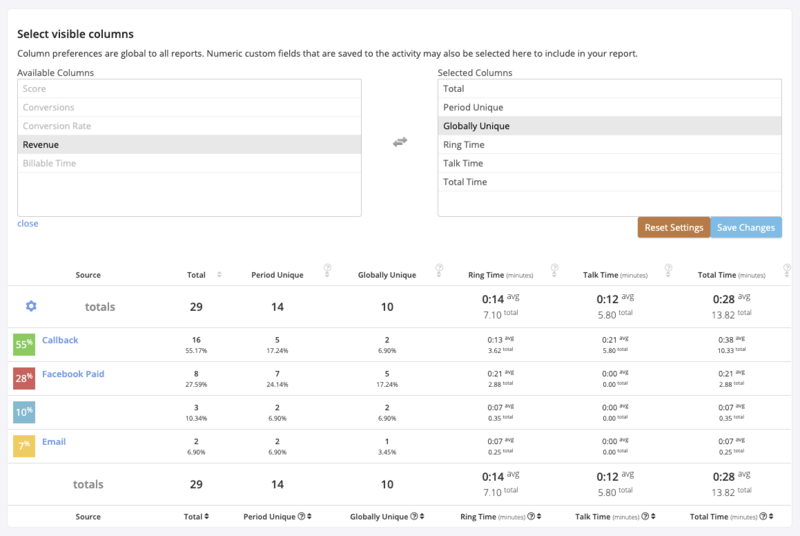 Export: Click Export to save the table of data for this report as a CSV or XLS file, create shareable link for the report, or create a Google Data Studio Connector for this report view. Downloaded reports do not include the graph shown on this page (10); only the table of data is included (12). Schedule Report: You can use schedules to have this report regularly emailed to multiple recipients. Report Dimension: This drop-down menu allows you to select the dimension to view in your report. For more details on which dimensions are available, see below. Add Dimension: A secondary dimension can be added to the report using this plus + sign. Graph Units: The Hour, Day, Week, and Month selectors change the date units shown on the report graph (10). These selectors do not affect the date range of the report. Graph Style: Click the graph style buttons to change the report graph (10) to a line graph or a bar graph. Report Graph: This graph visually represents the table of data for the report you have built. Select Visible Columns: Click the gear button to select which columns are shown in the report table (12). Some custom fields can be included in activity reports. Report Table: This table contains the relevant activity data based on the filters you have applied to the report. The default view when you open the Activity Reports page is calls by tracking source. To change this, click the drop-down menu in the top left of your report page and select a different dimension for your call data. Note that some view options (such as fields for specific integrations or enhanced caller ID) will only work if you are using the relevant features in your account. You can add a secondary dimension to your report view by clicking the plus sign + next to the dimension drop-down menu. Use the second menu to choose the secondary dimension. Click the minus sign – to remove the secondary dimension. You can further customize your report by applying filters. Click the Filter button in the top left of your report page to open the filter panel. From here, you can adjust your data to view calls from specific date range, a set of tracking numbers, tagged calls, or calls with a certain duration. Click Apply Filter to apply your selections to your current report view. If this is a filter you’ll use often, click Save Filter to create a shortcut for future reporting. In the upper right corner of the Activity Reports page, you will find buttons to customize the look of the graph on this page. Use the Hour, Day, Week, and Month buttons to change the units that are shown on the graph. If you’re viewing calls for a single day, using the Hour button here will give you a better idea of when calls are happening throughout the day. If you’re viewing calls for the last six months, the hour units will be too small to make much sense, so the Week or Month buttons might make more sense. Use the bar graph or line graph buttons to switch between those two versions of the graph. *For detailed information about Period Unique and Globally Unique metrics, see the full article here. You can use the gear icon on the left side of the table to show or hide the available columns as needed. If you have custom reporting fields in your account, you can use this option to have those fields included on this page. Select the view and apply all filters you want for your exported report. Click Export in the top right of your reports page and select your preferred file format (CSV or XLS) or a shareable link. When you generate a shareable link to a report, the link will be valid for 7 days. A pop-up will appear to confirm your export. Exports will be sent to the email address associated with your user profile. 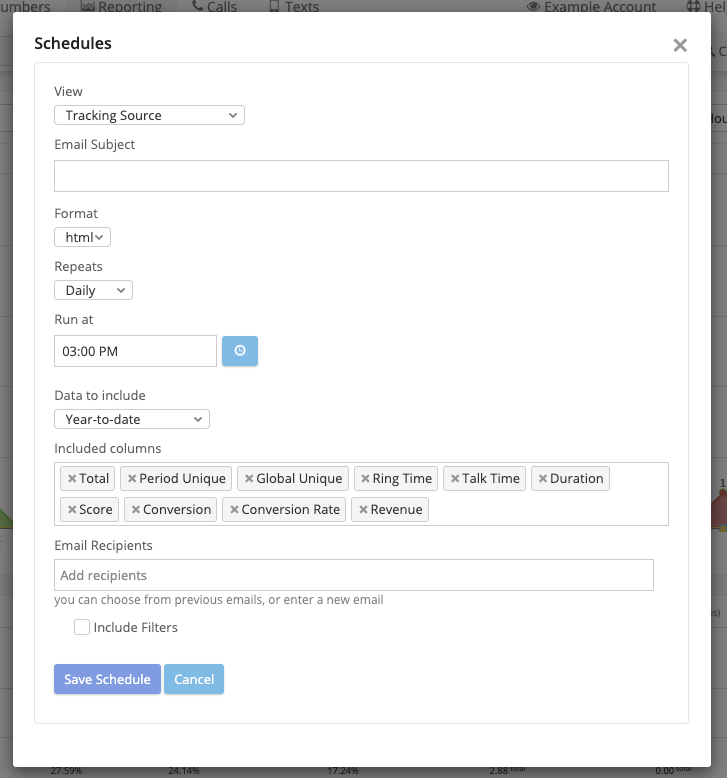 Apply all filters you want for your scheduled report, then click Schedules… in the upper right corner of the page. Select the dimension using the “View” drop-down menu. Enter the email subject that will be used when the report is delivered. Choose the format for the email: HTML, CSV, or XLS. Choose how often the report runs and the day and time you would like it to be generated. Use the “data to include” drop-down to select the date range for this report (such as yesterday, last month, or month-to-date). Select the metrics (data table columns) you want included in your report. By default, all columns are included. Add email addresses for everyone that you want to receive this report. Report recipients do not have to be users in your account. Check “Include Filters” to have your current filter applied when the report is generated. If you are not using a filter, leave the box unchecked. To view, edit, or add new scheduled reports, click the same Schedules… button in the upper right of your report page. Existing scheduled reports will be listed here. Select Data Studio to begin creating a Data Studio Connector using this report’s selected dimension and filters. For more information about the Google Data Studio integration, see the full article here.